Our financial advocates work in partnership with over 60 different support providers across the country. 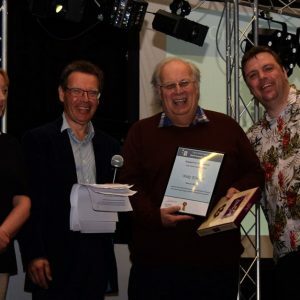 One of our advocates in East Anglia, Mike, recently won an award from one of the support providers he works with – Thera East Anglia. The award recognised the great support he providers to local teams and individuals. Here we ask him a bit about the award and his work for Dosh. What was your background before joining Dosh? I was working for a support provider in East Anglia and also working with Norfolk County Council Housing Project with My Safe Home, assisting individuals with a learning disability to buy their own homes – 14 were eventually bought. Before that, l worked for Argyll and Bute Council working in the Mental Health team, Children’s Protection Unit and Community Service team. What made you want to join Dosh? I was working in a supported living house and the finances were not working out and money had gone missing from a supported person’s bank account. Quirky is fate because the very next week a part-time position was advertised from a company called Dosh. The rest is history. How did you feel about winning an award for the support you provide in partnership with Thera East Anglia? My first reaction was embarrassment of having to walk through an auditorium full of people clapping, with support managers giving me a standing ovation, and then go on stage to accept the award from the Chairman of the Board, the Managing Director and Service Quality Director, scary. Once the embarrassment had gone, l felt that the promise l had made earlier to myself had been kept, so I am feeling very proud. Although the award has my name on it the award includes all the team in the Dosh office who do so much unrecognised by others that enables me to do what l do. Coffee, lots of coffee to start then into the filing system to check the post and plan any actions needed from the post, reply to any emails that have come in with either the answer or an appointment date. Then on the road, if a visit has been arranged. At this time I’m nearly overloaded with the new PIP forms needing completing in all parts of East Anglia. With Dosh annual reviews and money plans taking up a lot of the time at this time of the year, as well as visiting new people to support and new support companies, the time goes by quite quickly. How do you see your role as a financial advocate? How do you advocate for people? By applying simple rules. Making sure people have the right amount of money they are entitled too and to safeguard that money to make sure people can get the most out of life that is affordable to them. Would l, as an individual, accept what is being proposed to an individual with a learning disability? If not then l make sure l change it for the individual concerned. What is the best bit about being a financial advocate? Slightly odd answer first, it’s great to see the support teams being able to achieve what they want to achieve with individuals. This is brought about by making sure the funds are in place to achieve the hopes and ambitions of all. What do you feel has been your biggest achievement with Dosh? making sure everyone l support has a good life with enough money to get the best out of life they can. If you would like a financial advocate to support you or your team, have a look at our advocacy page or contact us directly. You can also read our blog on ‘what is advocacy?’ to learn more.